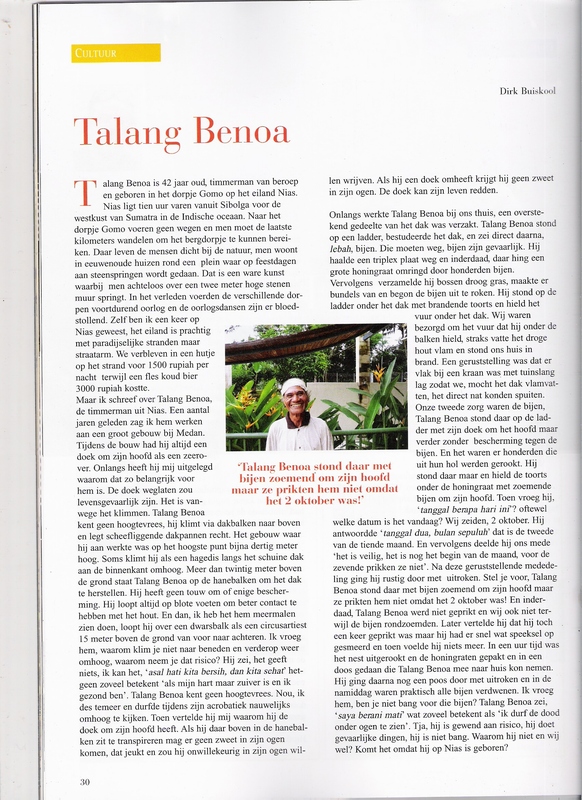 Talang Benoa worked at our home at an overhanging part of the roof. He was standing on a ladder, studied the roof, and said immediately afterwards, ‘bees… They have to go, bees are dangerous’. He took a sheet of plywood and indeed, there was a large honeycomb surrounded by hundreds of bees. Then he gathered dry grass from a nearby forest, turned it into bundles and began to smoke out the bees. He stood on the ladder under the roof with a flaming torch and kept the fire under the roof. We were worried about the fire that he held under the beams, the dry wood could catch fire and set our house alight. Fortunately there was a faucet with garden hose so that, should the wood catch fire, it could be sprayed wet directly. Our second concern was the bees. Talang Benoa stood on the ladder with his cloth around his head but otherwise he had no protection against the bees. There were hundreds who were smoked out of their holes. He stood there and held the torch under the honeycomb with bees buzzing around his head. Then he asked, “tanggal berapa hari ini?” (What date is it today?). We said, October 2nd. He replied ‘tanggal dua bulan sepuluh’. (The second of the tenth month). And then he informed us, it’s safe, it’s still the beginning of the month before the seventh, bees do not sting in the second of the tenth month. After this reassuring statement, he went on quietly to fumigate. Imagine, Talang Benoa stood there hundreds of bees humming around his head, but he was sure that they would not sting him because it was October 2nd! And indeed, Talang Benoa survived the bees that day. Talang Benoa later said he still was stung once at the very beginning but he quickly smeared some saliva on the wound and he felt nothing. In an hour’s time the nest was fumigated and the honeycomb packed and placed in a box so that Talang Benoa could take it home. He continued a while with fumigating and in the late afternoon almost all the bees had disappeared. I asked him, are you not afraid of the bees? Talang Benoa said, “saya berani mati” (I have no fear of death). Well, he is accustomed to risk, he does dangerous things, he is not afraid. Why is he not, while we are? Is it because he was born on Nias?